"Should I go to the hospital or ER for a cough or sore throat?" Coughs and sore throats often seem like common, everyday illnesses where you recover in a few days, especially during flu season, but if they are accompanied by any of the symptoms below or if your immune system is compromised due to an existing condition, you may need to seek emergency treatment. Coughs and sore throats often seem like par for the course—especially during flu season. But if they are accompanied by any of the symptoms below, or if your immune system is compromised due to an existing condition, you may need to seek emergency treatment. Presbyterian/St. Luke’s Medical Center, located at 2001 High Street in Denver, may be able to help you. 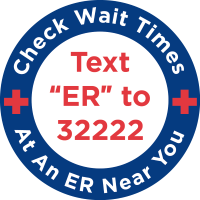 We strive to beat the national average wait time, so you can get quick access to high-quality emergency medical care. Learn more about our ER. The hospital’s main phone line is (303) 839-6000. Call us if you have any concerns that are not time-pressing about Presbyterian/St. Luke’s’ emergency room or medical center as a whole. If you or a loved one are experiencing an emergency, call 911 for immediate care! Expert, compassionate care is available 24/7 at our full-service adult and pediatric ER. We are located at 2001 N. High Street in Denver.